Pictures, photos & images of the Dolomites, Italy. The Dolomites are a drmatic range of mountains in the Northeast of Italy. They form a part of the Southern Limestone Alps and extend from the River Adige in the west to the Piave Valley (Pieve di Cadore) in the east. In the Western Dolmites is the Langkofel Group of mountains part of which is the Sassalungo mountain range with its highest summit 3181 high. 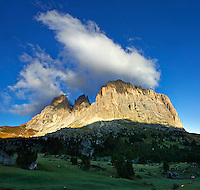 The Sassolungo mountains are typical of the Dolomites being made up of limestone that rises steeply to their peaks. Formed about 230 million years ago water errosion over time has formed sharp jagged rock formations and the peaks are often capped with trails of cloud at sunrise. The steepness of the mountain rock faces make them popular with climbers whist the lower slopes off skiers scenic pistes. 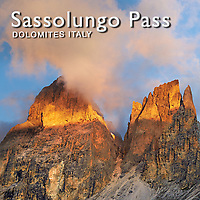 The Sassalungo mountain range of the Dolomites is situated between Val Gardena, Val di Fassa, Sella group and Catinaccio and it is allocated in a circular arc, opened towards north west. The Dolomites are a UNESCO World Heritage Site. The site of the Dolomites comprises a mountain range in the northern Italian Alps, numbering 18 peaks which rise to above 3,000 metres and cover 141,903 ha. It features some of the most beautiful mountain landscapes anywhere, with vertical walls, sheer cliffs and a high density of narrow, deep and long valleys. A serial property of nine areas that present a diversity of spectacular landscapes of international significance for geomorphology marked by steeples, pinnacles and rock walls, the site also contains glacial landforms and karst systems. It is characterized by dynamic processes with frequent landslides, floods and avalanches. The property also features one of the best examples of the preservation of Mesozoic carbonate platform systems, with fossil records.